This paper deals with the simulation of vertical displacement vehicle car body with one and two DOFs by using and comparing results of two softwares Working Model and MatLab. The aim of this paper was to show that is very easy is to solve the differential equations that describe both models of vehicle system with one and two DOFs. The results simulations performed with both software’s are almost the same for calculating displacement and velocity of sprung and unsprung mass and for different road excitations. The results of simulations have been analysed in terms of stability and road holding since sprung mass or vehicle body oscillations have direct impact on the passenger comfort. The structure of the system for supplying spare parts for tractors and self-propelled agricultural equipment has been examined. A centralized system of continuous inventory replenishment has been investigated and the influence of the basic parameters of the supply system on the probabilities of refusal of execution of requests is determined. It has been shown that the most significant impact on performance indicators of the spare parts supply system is the demand flow intensity. 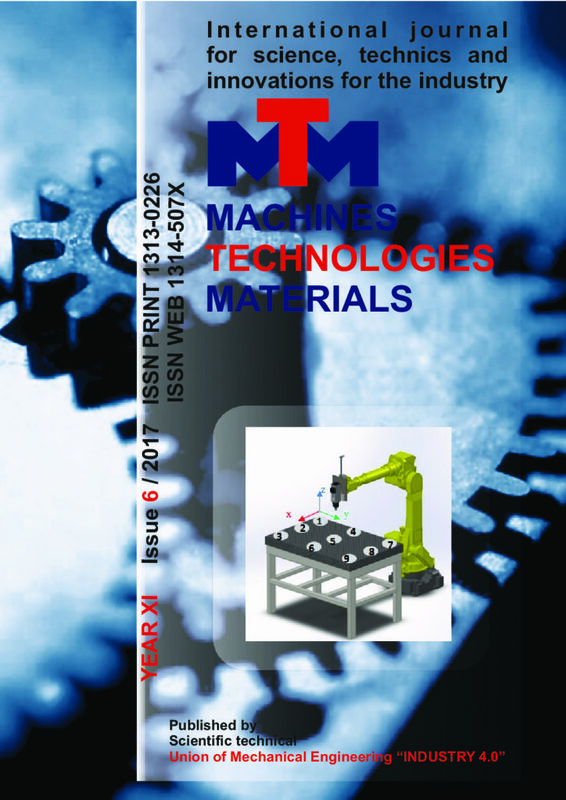 Flexible Manufacturing Systems provide a fast reaction possibility to the changes in production conditions. As production conditions change, other changes in the final product like changes of the product variants, or other unpredictable events may be also expected. Nowadays most of the products are designed by using the CAx software. The product design 3D model contains not only the geometrical data of product, but may contain a part of the process plan and technological data as well. This fact is a reason to quick reaction time possibilities in the manufacturing system settings. Traditional concept about the boundary layer structure, technique of the theoretical determination of a velocity profile in this layer, developed in first half of the 20th century, does not experienced, basically, any changes, although, on their close analysis a number of questions and even problems arises requiring their solution. First of all, it is referred to physical causes of the occurrence of turbulence in the boundary layer, conservation of its near-wall region, conformance of a classical logarithmic velocity profile to experimental data, the appropriateness of introduction of such definition as “a laminar sublayer in the turbulent boundary layer”. All these outstanding problems are considered in the following materials. The present work reports on a new silicotungstic acid catalyst supported on graphene (HSiW/G). The deposition was performed by sonochemical method proven as an effective technique for the synthesis of the supported catalysts. The catalyst (HSiW/G) was characterized using a variety of physico-chemical methods as TEM, HR SEM, DLS, FTIR and Raman spectroscopy. Homogeneous distribution of HSiW on the surface of graphene was demonstrated. Hydrolysis of biomass for the production of glucose was studied. The hydrolysis of glycogen was performed with a HSiW/G catalyst by hydrothermal treatment. The yield of glucose (65 wt%) obtained was about 8 times higher than that obtained with the same amount of bare HSiW. Stability of the HSiW/graphene even after 3 repeated uses was confirmed. The mechanism of enhancement of the catalytic activity was discussed in terms of a special interaction between the graphene support and HSiW and also the appearance of hydrophobic cavities on the surface of graphene. The paper presents the results of testing of a high-performance method for decontaminating sewage, involving combination of ultrasonic and ultraviolet exposure at the final step of water purification aimed at destroying pathogenic microorganisms and thereby preventing the spread of infectious diseases. A variation of the method was developed and patented by the authors and passed the test at one of the most advanced water facilities in Russia which is the Vodokanal of St. Petersburg. The combined unit was manufactured at OOO Novotech-EKO and installed at the South-West Wastewater Treatment Plant (SWTP) of Vodokanal of St. Petersburg. Efficiency of some traditional chemical technologies in different areas could be significantly increased by adding ultrasonic treatment. For example, ultrasonic treatment was found to improve make-up water systems, decontamination procedures, etc. Improvement of traditional chemical technologies with implementation of ultrasonic treatment has allowed to significantly reducing water waste, including harmful species and radioactive products. Accurate simulation and prediction of losses in power transformer is important during transformer lifetime but also during the design stage. Paper presents the simulation model of transformer based of Finite Element Method that allows calculation of core losses and magnetic flux density in transformer cross-section. Two different models are constructed for 2D and 3D simulation. Obtained results are compared with experiments. Finally, flux density in both models is calculated and obtained results are presented for different time steps. The basic features of calculating the reliability of agricultural machinery are shown, in contrast to industries such as mechanical engineering, radio and television equipment, automation systems and etc., in which machines and apparatus operate in steady modes, while agricultural machines do in difficult soil and climatic and dynamic conditions. Еconomic aspect of reliability is substantiated and patterns of change in the efficiency of use of agricultural machinery in time are established, the economic parameters of reliability are determined. With the help of the theory of similarity and dimensions as well as the planning of multifactor experiments, through the original installation manufactured by us, the basic physical and mechanical properties of metal coatings are studied, obtained by welding under flux, there are relevant similarity criteria determined that characterize the process of restoration of worn parts and, after processing of experimental data an analytical view of criterion equation is formed and rational modes of the restoration of parts under submerged arc welding are set. Further, to optimize the process, the scheduling theory of extreme experiments has been used and as factors in the regression equation there have been chosen most significant similarity criteria. In methodics elaborated by us, it was obtained an adequate equation and by a method of steep ascent (movement along the gradient), there were determined optimal modes of recovery for metal coatings with high physical and mechanical properties (hardness, wear resistance). Under these regimes there were recovered worn ploughshares and their operational check showed an increase of resource as many as 1.4…1.5 times. For surfacing worn parts with complex configurations (ploughshare plows, cultivators paws), we have manufactured a special copier allowing to recover the items automatically, in a continuous mode. The feasibility study of the developed resource-saving innovative technology has shown that the restoration of 800 ploughshares provides an yearly economic effect of EURO 1,462. The plunge galloping is a high-amplitude, low-frequency oscillation of a slender structure, such as iced conductors of a power transmission line or bridge decks, essentially perpendicular to the wind direction. In the paper, an idealized model for the plunge galloping is shortly reviewed and then a slight modification of the variational iteration method, applicable to weakly nonlinear problems, is employed to obtain a system of two amplitude-frequency equations that provide both the transitional and long-term behaviours. The approximate analytical results derived in the paper have been applied to a typical section model and the numerical results are contrasted with those provided by the direct integration of equation of motion. In the production of oil in the oil mill parts of the equipment wear due to contact with seeds which contain microabrasive particles. This wear manifests itself by changing the dimensions and geometry of the screw press. The paper analyzes the influence of tribocorrosive wear on the workpieces of the screw press. The appearance of wear is most likely due to the action of aggressive media, in this case the oilseeds. In the experimental part of this paper, on samples made of cast steel and austenistic stainless steel, following laboratory tests were performed: electrochemical testing, testing of chemical composition of the base material, wear analysis, microstructure recording and hardness testing. Based on the laboratory testing, conclusion was that the austenistic stainless steels 304L and 316L with nitrated surfaces exhibit better resistance to tribo-corrosion wear in relation to cast steel GS-42CrMo4.